Lightly spoon the flour into the measuring cups (use a flat sided knife to level). Add the flour to a large bowl. Measure the salt into the flour and stir well. Beat the egg in a small bowl with the 1 t vinegar. Reserve 5 T cold water in a small bowl. Add the shortening to the flour. Using a fork and a cutting or slicing motion, blend the shortening into the flour until the mixture is consistent in texture – evenly sized tiny little balls (smaller than peas). This step is one magical trick to get a flaky crust. Add the egg vinegar mixture to the flour. Stir just to the point of where it is mostly mixed in. Just a few stirs is all you need. Add water a tablespoon at a time, stirring only until all the dry particles are moistened. Over stirring results in a less flaky crust, so stop adding water and stirring as soon as the dry ingredients are moistened. Divide the dough into two equal halves and press into two small balls. Wrap each ball with a piece of wax paper or a tea towel to keep them moist. They can be made to this point and put in the refrigerator or freezer – when you want to use them, make sure they sit out long enough to come to room temperature. They will not roll as well if cold. Set up a cleanable surface for rolling. Wax paper is fine. I love my very old Tupperware dough rolling mat that has pie pans drawn into it so I know just how far to roll each ball of dough. If you do not have a marked surface to roll on, hover the pie pan upside down over the rolled out dough and make sure make sure the dough is wide enough to fit inside the pan with sufficiently overlap so you can make those pretty ridges around the edge. 3/4 inch to 1 inch will do you fine. There is no need for precision. Sprinkle flour on the rolling surface and place one ball in the center of the flour. Sprinkle a bit of flour on top. Use your hands to flatten the ball out into a reasonably round shape. If you see cracks, moisten your finger in a little water and use that to seal the cracks. The dough is very forgiving to a finger dipped in water when corrections are needed. No stress needed. Using the rolling pin, roll from the center outward in all directions. Turn the dough frequently as you go, fixing any new cracks. You will need to sprinkle the round with more flour to keep the pin from sticking to the dough – and to check that the dough is not sticking to your surface. Just turn it every now and then and sprinkle more flour as needed. If the dough sticks before you can stop it, gently loosen the crust and add a bit more flour underneath. Keep the rolling pin pressure even as you do roll and you will have a crust that is even in thickness all around bringing your guests to their feet as they stand and applaud. Continue dusting with flour, fixing cracks with water, and rolling until the dough is the correct size for the pan. Spray the pie pan with cooking spray. Gently pick up the rolled out dough and place it, centered, into the pan. Press just enough to help the dough conform to the pan shape. If there are areas where the crust extends beyond an inch over the edge of the pan, pinch the excess off and reserve to use for patchwork pieces for those spots where the dough was a little thin. See? Still no stress. If your pie only has a bottom crust, gently poke the crust with the tines of the fork a few times and then crimp before adding the filling. 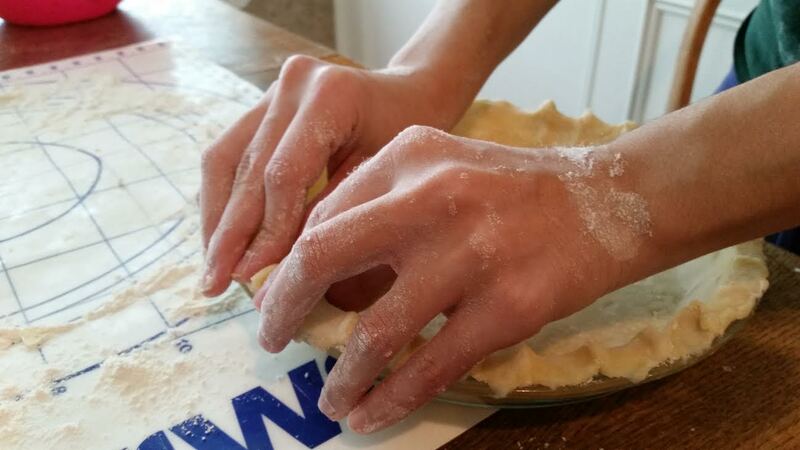 If you are making a pie with a crusty top, add filling to the gently poked crust, repeat the rolling with the second crust, and center it on top before fluting. 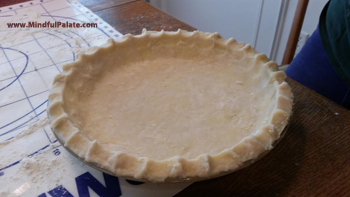 Fluting, or crimping, the crust edges add a bit of pretty embellishment to the finished pie – and raises the edge just a bit which is helpful to prevent spillover. Use your fingers and work the overhanging dough around the edges with a pinching motion to seal the edge and create doughy ridges. If an area is too thin to flute, use one of your patchwork pieces and a little water to augment the area. Anyone can do this. If at any time your crust tears or develops holes or thin spots, don’t despair – patch! Cover the fluted pie edges with strips of foil so the raised fluted ridges don’t brown too quickly. Then bake as directed by the filling recipe. Yes, I know, they make special pie crust covers you can buy to place on the flutes. They do not work as well as aluminum foil. But if you like them for their ease of use, go right ahead and spend the money. If you put a top crust on the pie, cut some nice decorative and also functional steam vents in the top crust. You may use either a sharp knife or a fork to create pretty shapes. This will allow the pie filling and the crust to bake instead of steam. As long as you do not overwork or over-saturate the dough, it will be amazingly tender and flaky. So don’t fuss it too much, just mix it, press it out, repair the bits, and stick it in the pan. Just like Mama did. Now, let’s make a pie! How about a Classic Apple Pie? This recipe includes another wonderful recipe for pie dough. Experiment. One cannot really eat too many pies as long as the goal is determining which pie crust your family likes best. It’s all in the name of science. This entry was posted in Dessert, The Spoon Mage Explains and tagged easy, how to, making pie crust. Bookmark the permalink.